Another birthday has just passed me by, always a good time for reflection I say. I write a list each year, goals that I want to accomplish, things I want to do. As I look back on my list from last year, I check off some things as done, I scratch off some things that aren’t important to me anymore and add some new ones to the list. It’s interesting to see the list change as the years pass. Last year the big goal was to run my first (and God help me, I hope my only) full marathon. 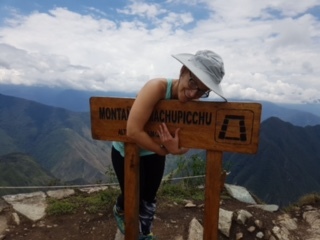 This year it was scaling the Andes on the Inca Trail in Peru. After the first day on that four day trek, I decided to ‘retire’ from all these silly stunts, from pushing myself. I declared that I had nothing left to prove to anyone and didn’t have to do this ‘stuff’ anymore. I was done! But by day four – like giving birth, it didn’t seem so bad and I wondered what was next. I realized I’m not pushing myself to have a story to tell, to set a good example or to prove anything to anyone. I’m doing it because I can. Because I want to. Because it’s who I am. This year, as I reflect, I am so grateful my Mom, at 92, is happy and healthy. She had me at 40 – some might say I was ‘an accident’ but she calls me her ‘Angel of the Lord’ – and that’s pretty irreplaceable. My three kids are grown and capable, independent and contributing members of society. They don’t need me much anymore, but I know that even though they have other loves in their lives, no one can ever love them as much as and as unconditionally as I do. The Hub – as we creep into the 30 years married mark (in a row! ), this guy still thinks I’m beautiful and tells me so daily. Everyday he makes my life easier and still loves me even when he see’s my ugly side that the public isn’t privy to. That we have moved our life across the country, gave away almost all of our belongings and are making a new life within our old life, finding a new ebb and flow on the west coast, setting our calendars to the tides and resetting this life – just us, without our kids at the core. Odd but wonderful. And so as I slide into my 52nd year, while I have health and opportunity on my side, I shall continue to live my life in my own wacky and wonderful way – imperfectly perfect for me. My birthday wish is that I hope you will do the same for yourself, create a perfectly imperfect life (and you) you love. Now read this quote again – slowly and let it sink in. This entry was posted in Empowerment, Happiness, Health, Motivation, Newsletters, Overcoming Obstacles, Personal Growth and tagged e-news, empowerment, happiness, health, Motivation, personal growth, Stephanie Staples, Your Life Unlimited. Bookmark the permalink. Next Next post: Tu Vide, Ilimitada!